One of the best things about online shopping is that it cuts the price of shopping around—you can find the best deal for you, whether it’s down the street or shipped direct from Taiwan. With these apps on your smartphone, you can connect to that global market even when you’re walking through the mall or grocery store. You’ll be surprised at how often a simple, free app can save you money. This app will change the way you shop. It uses your phone’s camera to scan UPC, EAN, and QR barcodes at any store you visit, instantly comparing prices for that item at both online and local retailers. Before you buy a book, Red Laser will check local library listings to see if it’s available for free. You can use it to optimize your shopping habits—getting things online when possible, and finding the best brick-and-mortar stores for when you need to shop locally. It has surprisingly sophisticated image search functionality, so you can still find a product online even if you don’t have the barcode. If you’ve already got a smartphone with wireless internet, this app can only save you money, and it easily tops our list. As the name implies, Coupon Sherpa eliminates the need to clip and carry around a bundle of coupons when you do your grocery shopping. You can find coupons on the app or scan paper coupons, and the clerk at the store simply scans your smartphone to quickly access all the coupons you’ve chosen. One of the limitations of this app is store selection—most of the participating stores are large retailers, so you probably won’t be able to use Coupon Sherpa at your local grocer or specialty store. Check Coupon Sherpa’s list of participating stores to see if the download is worth your time; but it’s free, and stores like Wal-Mart that accept competitor coupons can save you a lot of money with each trip. If you’re not familiar with Groupon yet, it’s a great way to access deals on local entertainment and luxury goods. This app might save you money if you already have a taste for the finer things; if not, you might find that it allows you to fit a few more of them into your budget. For most users, their experience leans more toward trying new things, rather than saving money on things they’d buy anyway; but it’s free, and can radically improve the quality of your weekends. If you’re serious about saving money at the grocery store, you might not even notice the sticker price—for you, it’s all about the price-per-unit. The problem is, stores don’t always measure products the same way, and percentage discounts can make the math a little complicated. 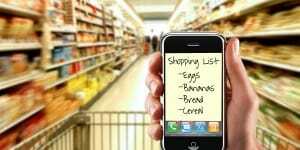 You don’t have time to break out a pad and paper in the grocery aisle, but this app can handle it for you. You might be surprised by what you find—buying in bulk isn’t always the best deal, and sometimes a sale can make the luxury brand a better deal. The $1.99 price tag keeps this app from a higher spot on the list. This app is great for anyone who does a lot of window-shopping. Big-box stores can be over-priced compared to online, but savvy shoppers often go to Best Buy just to test-drive a new camera or TV before buying online. This app allows you to earn “walk-in rewards” simply for visiting participating stores. Once you enter, Shopkick will offer you deals in that store, but you get the points whether you buy anything or not. You can redeem your points for rewards like iTunes gift cards, restaurant vouchers, movie tickets, etc.